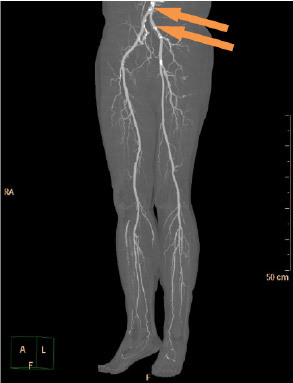 Arrows indicate multiple patchy calcified sites on the descending aorta and bilateral femoral arteries. 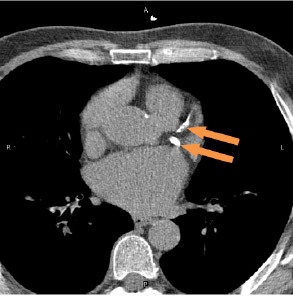 Arrows indicate extensive calcification of the left coronary artery. The patient was placed on Warfarin, a vitamin K-depleting drug, over a decade ago to prevent blood clots forming due to chronic atrial fibrillation (fluttering top chambers of the heart). Doctors now ask, is the reduced risk of blood clots with warfarin outweighed by the risks of arterial calcification – and the risks of other vitamin K deficiency disorders affecting bone, brain, small blood vessels in the kidneys and more? Doctors advise supplementation with vitamin K2 and other dietary measures you can read by accessing the full report published in the Asia Pacific Journal of Clinical Nutrition. Prolonged Warfarin use appears to trade one form of circulatory disease for another. © 2014 Bill Sardi Knowledge of Health, Inc.